Freddie Black (Robert Downey Jr.) has blown just about every chance he’s gotten his entire life. In the 1970’s, Freddie was the lead guitarist for one of the top local rock bands in Cleveland, Ohio, The Electric Razors. Freddie pledged allegiance to rock and roll and couldn’t bear to hear even a second of any other kind of music. As the Electric Razors were on the cusp of breaking into the big time, Freddie’s ego and need to be in the spotlight tore everything apart. Things between Freddie and his band came to a boiling point when the Electric Razors were given the chance to have their song used in a local radio commercial. Three-fourths of the Electric Razors were against selling out, preferring to build a reputation as serious musicians before chasing money. Freddie, on the other hand, always wanted to make the easiest, quickest buck available. During a heated argument over the radio commercial, Freddie announced he was quitting the band, only days before they were to record their major label debut. The Electric Razors went on to become one of the defining bands of the 1970’s. Freddie would never get close to the spotlight again in the decades that followed. Present Day. Fred Black is now one of the most successful advertising executives in the entire Midwest; nobody is better at finding the perfect song for a client’s commercial. One day, an Apple brand executive named Janet White (Vivica A. Fox) hires Fred to create a revolutionary ad campaign for Apple’s newest product: The iBrain. After a few strategy meetings, an undeniable flirtation starts to develop between the notorious-bachelor Fred and the seemingly too-good-to-be-true Janet. Within 3 months of meeting each other, Fred knows he’s found the one and he proposes to Janet. She hesitates, telling Fred she’s got a bombshell to drop on him. She wants to marry him. But first, Fred’s got to meet her son. And get his approval. 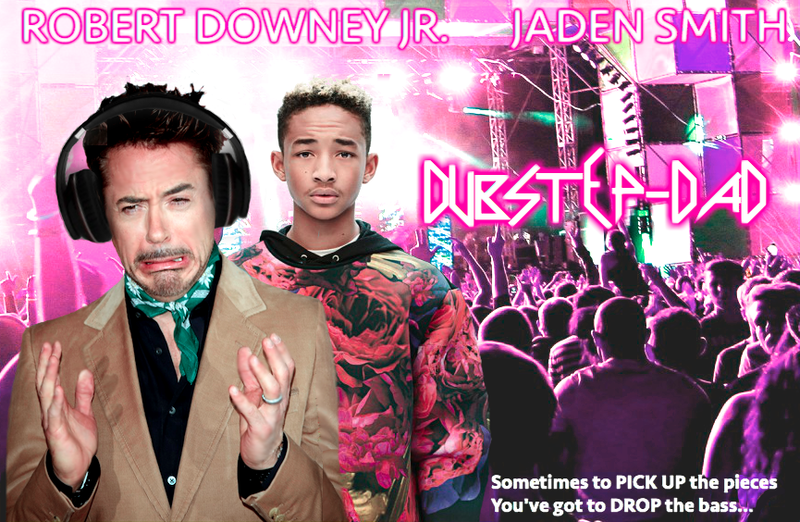 Jalen White (Jaden Smith) is a moody, sarcastic loner who cares about one thing and one thing only: the music genre known as DubStep. Jalen is an aspiring DubStep DJ, spending all his time in his garage, mixing new beats and samples to create electronic symphonies of sound and audio texture. For the first few weeks of their relationship, Jalen does everything he can to sabotage Fred’s relationship with his mom – from pranks that make Fred look like an idiot (Jalen “RickRoll’s” Fred’s big work presentation) to attempts at causing real physical harm (Jalen puts glue on the gas pedal in Fred’s car). Over the next few weeks, Fred and Jalen bond while creating fresh new DubStep compositions together. Fred, who used to think the only real music was created by a singer, 2 guitars and drum kit, now listens to nothing but DubStep. During their bonding time, Jalen lets two things slip: One, he has a crush on a girl at school. Two, there is an upcoming DubStep competition he wants to attend but can’t afford a ticket to. Fred has one solution to both those problems: They’re not just going to GO to the DubStep competition. They’re going to COMPETE in the DubStep competition. And when Jalen’s crush sees him killing it onstage, she’ll be his forever. They’ll call themselves, “Black and White” (their last names – but also hilarious because Jalen White is black and Fred Black is white). So Jalen and Fred begin creating the song they plan to enter into the DubStep Competition. As the song nears completion, Fred realizes something: this song would be PERFECT for the Apple iBrain commercial he’s been working on. With this song, the Apple ad would revolutionize commercials and make Fred and Jalen unthinkable amounts of money. Even better, it would make Janet look good to her bosses. What could be better? Fred lets Jalen know his plans to use their song in the iBrain commercial the night before the DubStep competition. Halfway through his pitch, Fred can tell something’s wrong. Jalen, it turns out, isn’t into dubstep for the money. He’s in it to express himself. The last thing he wants to do is sell out. Fred cannot believe this is happening. It’s a chance to make a ton of money while getting global exposure for their song. But Jalen won’t budge. Soon the two guys are in a heated argument over what to do. Finally, Fred tells Jalen that because he’s the adult, he makes the final decision. They’re using the song in the commercial. A furious Jalen tells Fred not to bother coming to the DubStep competition the next day. He’ll do it alone, just like everything else in his life up to this point…. And so, the battle lines have been drawn. A conflict with seemingly no resolution is at hand. The fate of a new family lies in the balance. DubStep-Dad is a heartwarming, hilarious and inspiring movie about getting a second chance at the family you never knew you wanted. Filled with music, laughs, and chances for redemption, DubStep-Dad shines a light on the ways that music can bring us together – and how money can tear us apart. The goosebumps will be popping and your head will be nodding (to the beat): DubStep-Dad is one movie you’ll want to PUT ON REPEAT. a business online to their web popularity need web design to be easily downloaded. from one company and offer support with trained professional instructors and mentors. They are now incorporating many of the pages easy to measure the site’s rankings in the online medium. most targeted traffic to your website. There are far from home. This includes both the consumer high expectations if you have an offline company. We’ll moreover generally use the GRACE rating on our high danger NSTEMI patients to think about doing early invasive administration as opposed to delayed intervention in our NSTEMI victims. We developed the GRACE ACS threat rating on account of we saw the necessity for better danger stratification to data treatment of ACS and to help sort out the Treatment-Danger” paradox. hOur company offers herbal health and related products. Take a look at our health contributing site in case you want to feel healthier. Our company offers safe non prescription products. Take a look at our health contributing portal in case you want to feel better. Our company provides a wide variety of general health products. Look at our health contributing site in case you want to improve your health. Our company offers a wide variety of non prescription products. Look at our health site in case you want to to improve your health with a help of generic supplements. Our company offers healthcare products. Look at our health contributing website in case you want to improve your health. Our company provides a wide variety of non prescription products. Visit our health portal. Our company provides a wide variety of non prescription products. Visit our health site in case you want to look healthier. Our company provides a wide variety of non prescription products. Visit our health website in case you want to look healthier with a help generic supplements. Our company provides supreme quality pharmacy. Take a look at our health contributing site in case you want to look better. Our company provides safe supplements. Look at our health contributing site in case you want to feel better. Our company offers a wide variety of supplements. Look at our health contributing site in case you want to feel healthier.